The soaring sandstone walls of the Taragarh fort stand guard over the present city of Bundi. 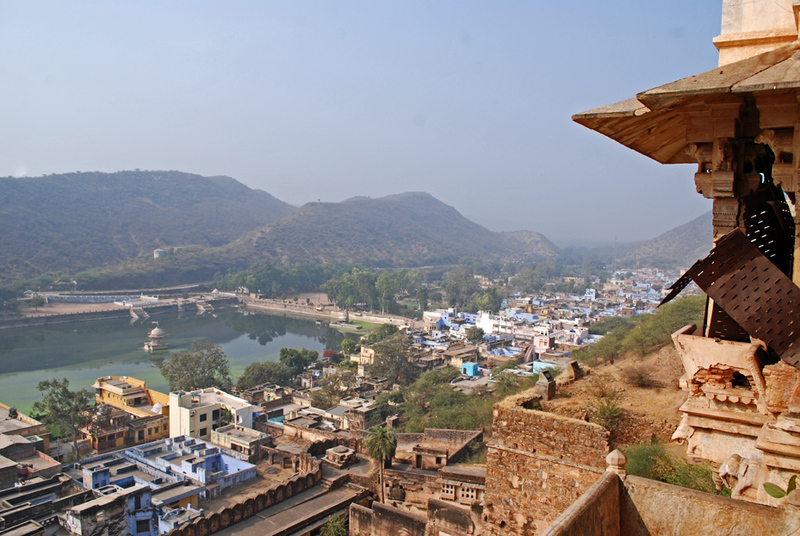 From its ramparts one has a clear view of the surrounding mountains, the blue houses and the black kites soaring above the city, riding the thermals and waiting to swoop down on unsuspecting prey. Once you enter the fortress through the lofty Hati Pol (Elephant Gate), it is but a study in contrast. 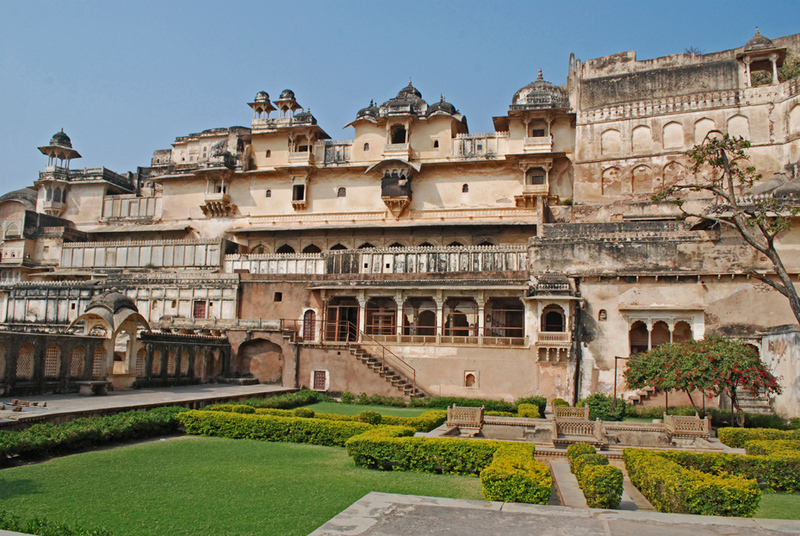 The construction started in 1354 and the present structure is but an agglomeration of the various palaces built thereafter by the rulers of Bundi. While most of these individual palaces are in dire need of repair (thanks to the litigation among the surviving members of the royal family), some have been taken over by the Archaeological Survey of India and given a fresh lease of life. 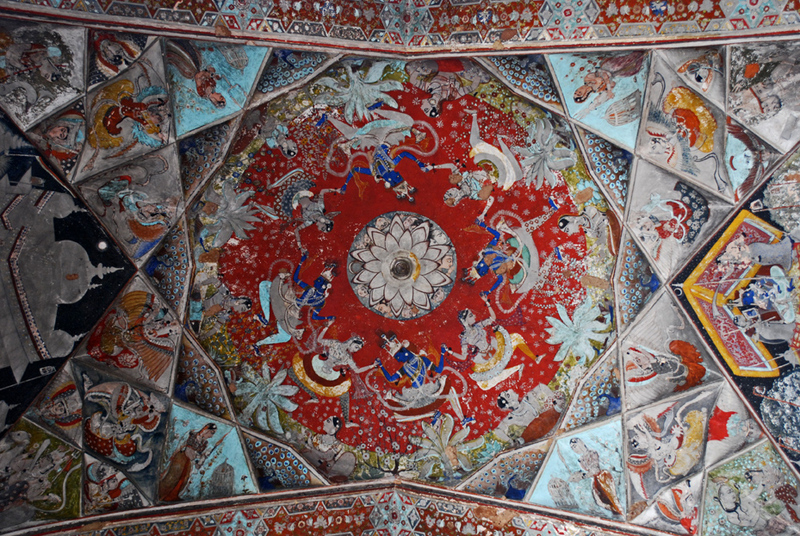 Whatever be the state of preservation, the palaces in Taragarh have one thing in common – frescos. 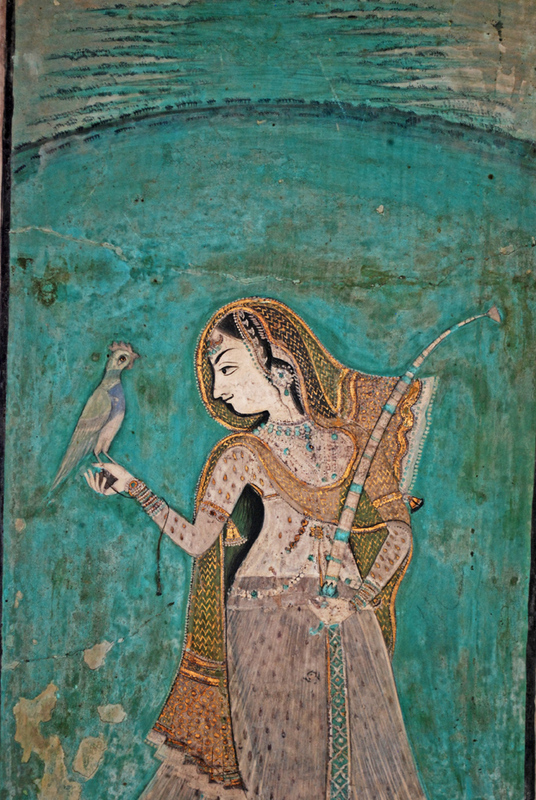 These paintings follow the Bundi style of miniature art. 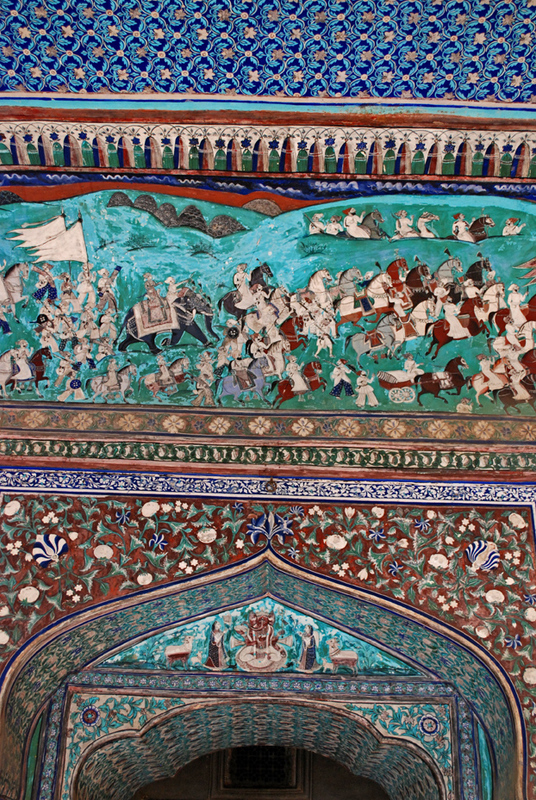 While the other kingdom of Rajputana like Amber, Mewar and Marwar were heavily influenced by Mughal Miniature art, the painters of Bundi borrowed elements from the miniature art forms of Deccan, thus giving rise to a unique style. 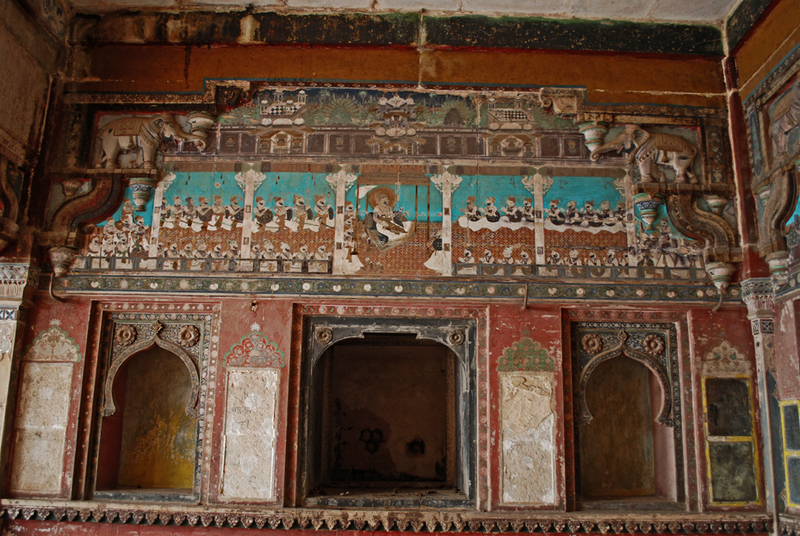 The bright colours of Bundi miniatures and frescos are derived from minerals, vegetables, precious stones, as well as pure silver and gold. 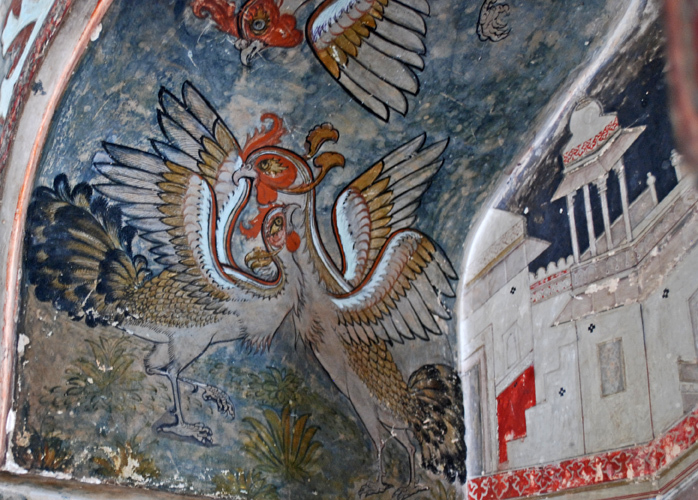 The paintings deal with both secular and religious themes. They also showcase the physical beauty of the Hadoti region, the rivers, the dense forests, dramatic night skies and feature ‘a distinctive way of depicting water by light swirls against a dark background, and vivid movement’. 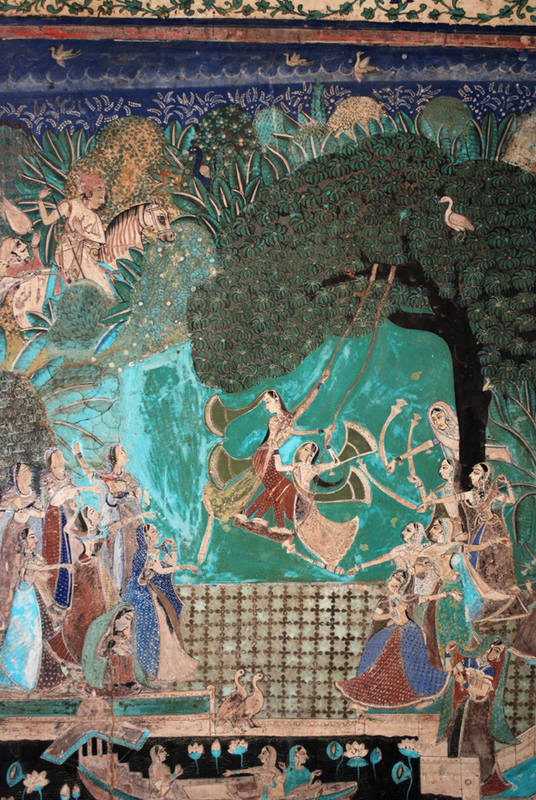 Bundi miniatures emphasized on hunting, court scenes, festivals, processions, life of nobles, lovers, animals, birds and scenes from Lord Krishna’s life. 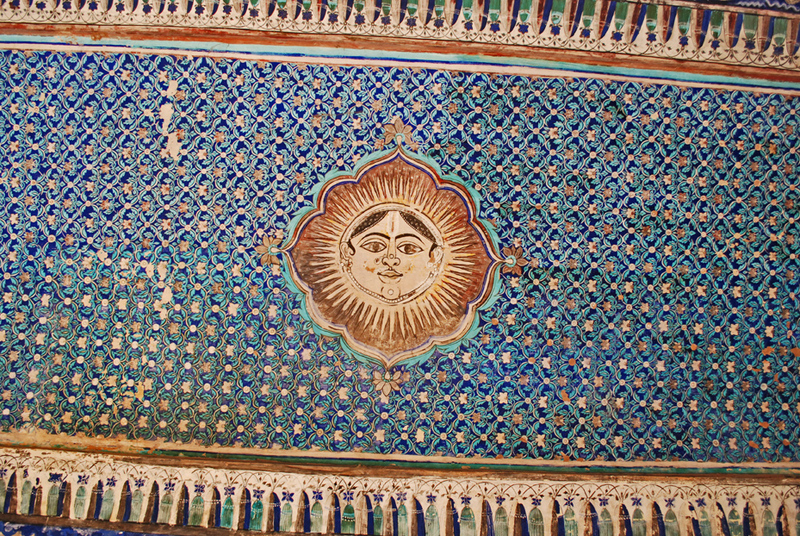 Apart from Chitrashala (discussed later), a rich collection of paintings can be found on the walls and ceilings of Badal Mahal (Palace of Clouds). 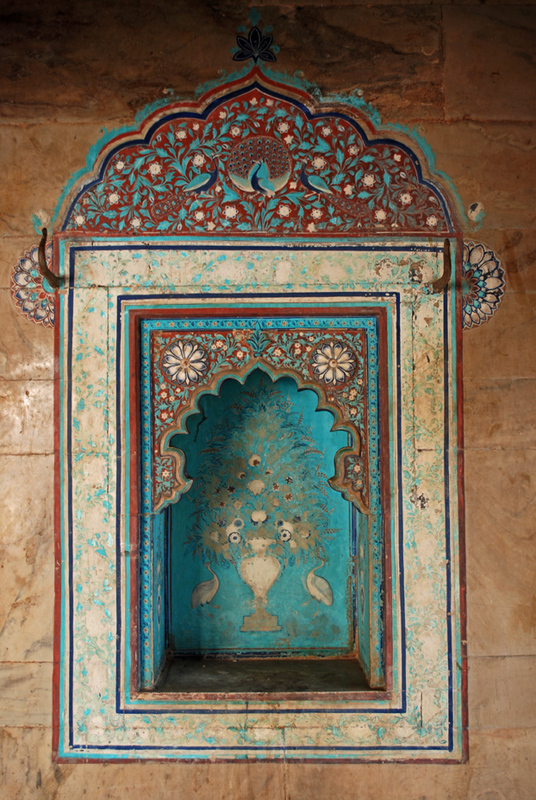 Occupying some of the highest rooms in the Taragarh Fort, it is said that during the monsoons, the low hanging rain clouds would actually float through the courtyards of the Badal Mahal. 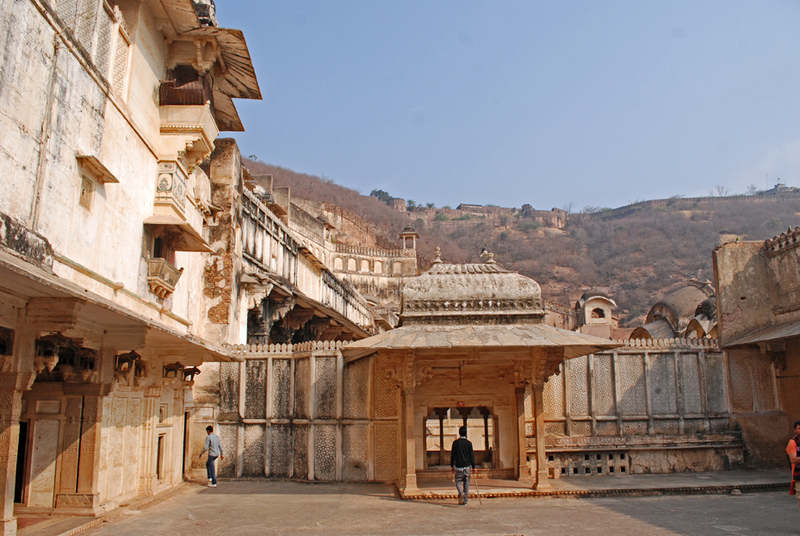 Almost tucked away in a corner and accessed by narrow flight of stairs, Badal Mahal once served as the zenana or the women’s quarters, housing the harem of the then ruler Rao Bhoj. Women then had no access to the outside wall except what they could see through the latticed windows. 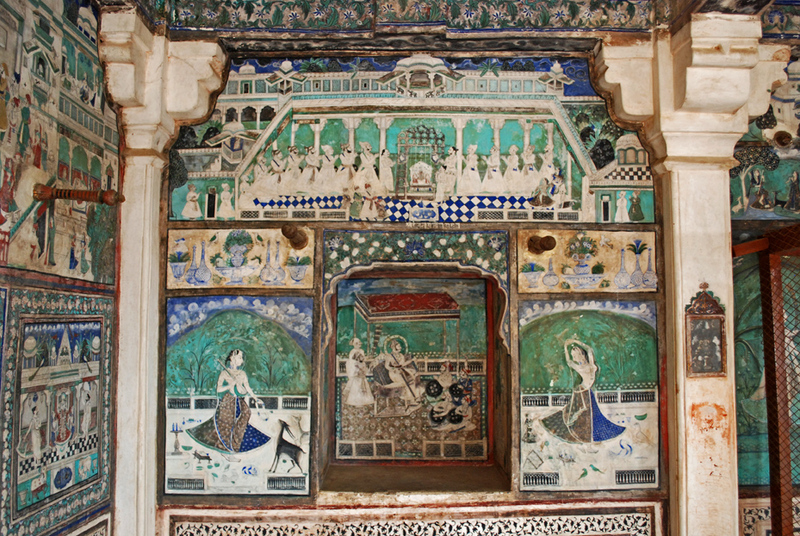 The paintings on the walls and ceilings of Badal Mahal, depicting battle formations, rural life, fantastic beasts and heavenly creatures and even scenes from a royal darbar might have served as a portal to the outside world for the ladies. A strange, gilded prison. 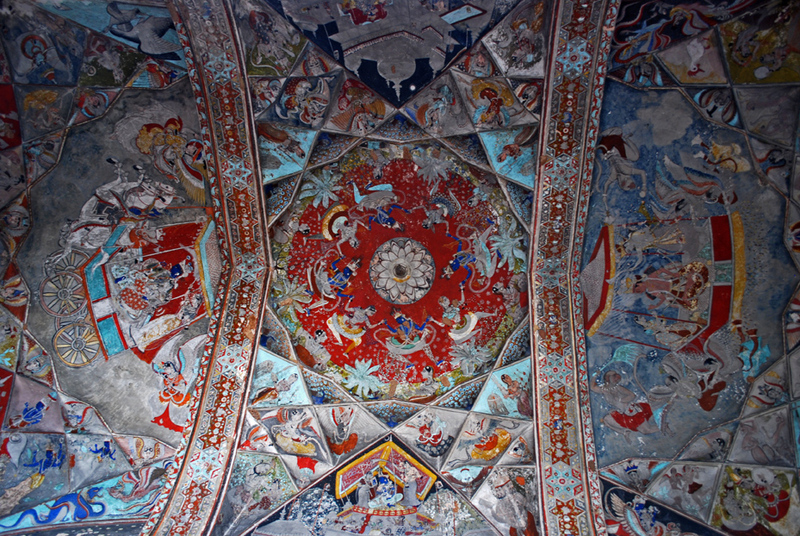 The centerpiece of Badal Mahal is definitely the ceiling of its topmost chamber. 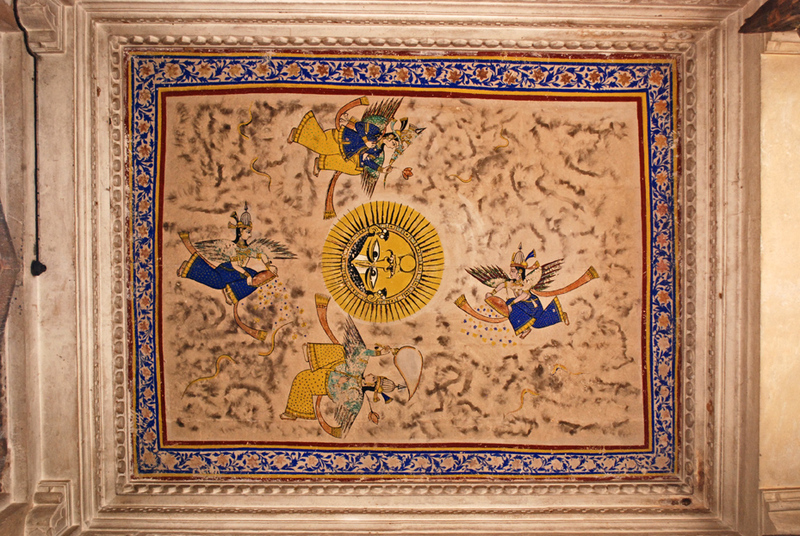 Sometimes referred to as Rajasthan’s Sistine Chapel, the mural on the ceiling depicts, in painstaking detail, the raas leela of Krishna. 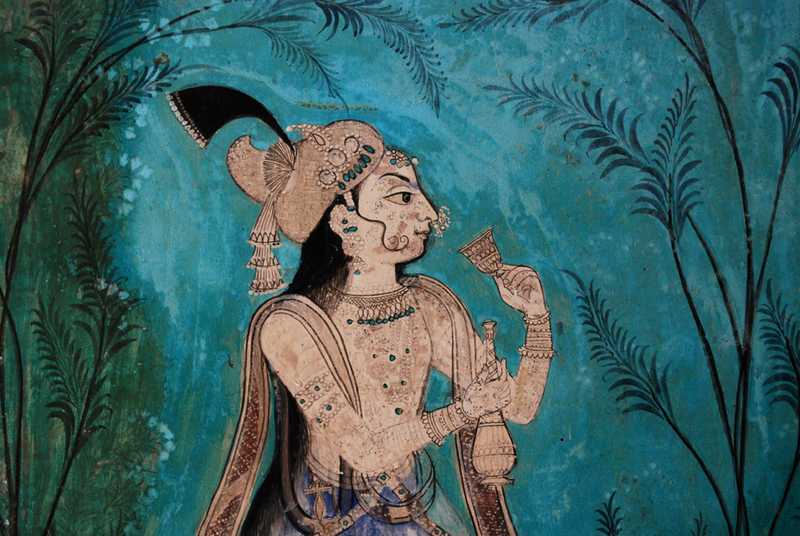 For the next collection of Bundi miniatures, head over to the Chitrashala. Previously known as Ummed Mahal after Maharaja Ummed Singh, this section of the fort was taken over by the Archaeological Survey of India, restored and preserved. If you find yourself here, please avoid flash photography. 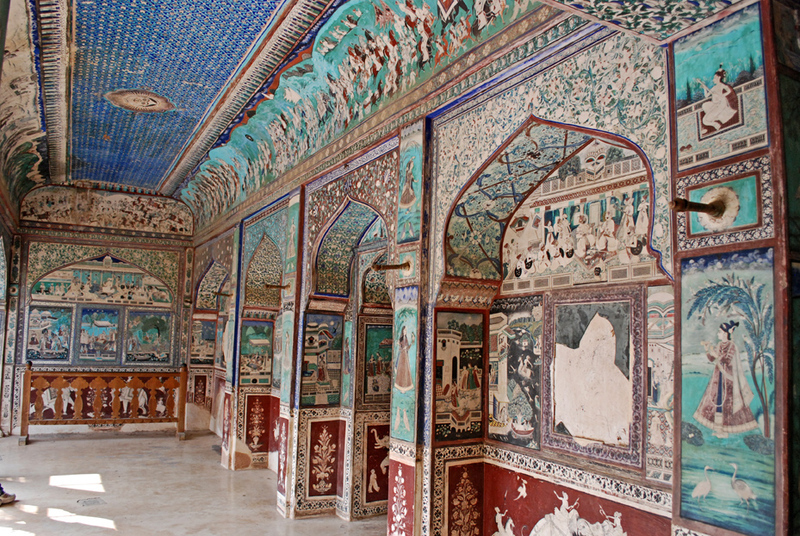 The walls of Chitrashala come alive with the life and exploits of the kings and queens of Bundi. 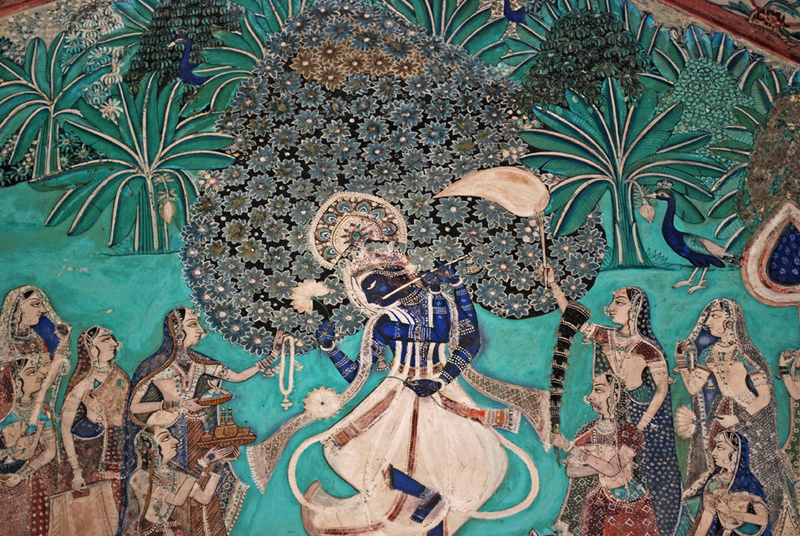 Along with the royals, Lord Krishna can also be seen playing his flute, gamboling on meadows with his gopis and getting up to all sorts of cosmic mischief. 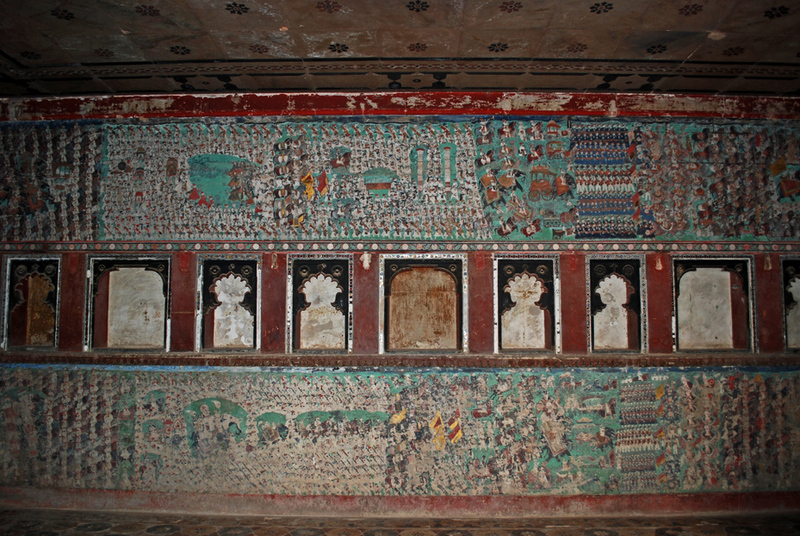 Most of the paintings you see here were done between 1773 and 1821. 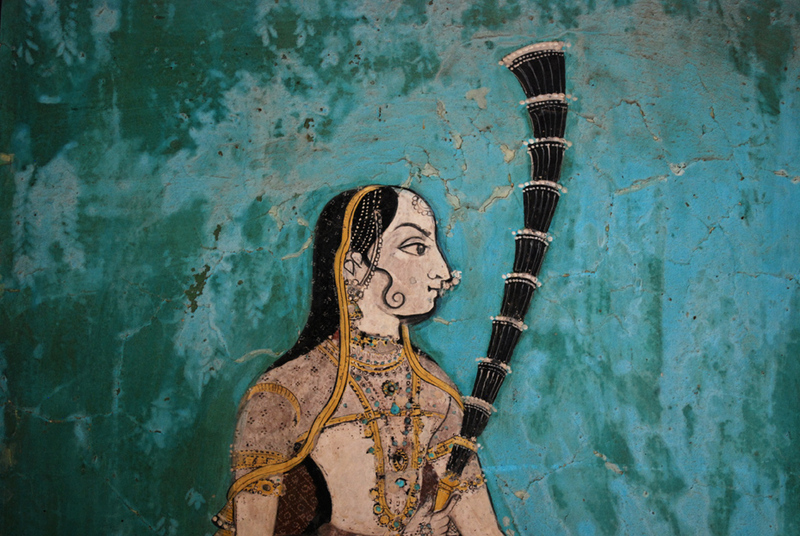 The artists of Chitrashala, and indeed of Bundi had their own standard of depicting feminine beauty. Women are portrayed with small round faces, receding foreheads, prominent noses and full cheeks. The royal ladies of chitrashala are shown wearing a transparent Jama over pyjamas. Featured prominently on most paintings is a background comprising of lush landscapes painted in vibrant colors. 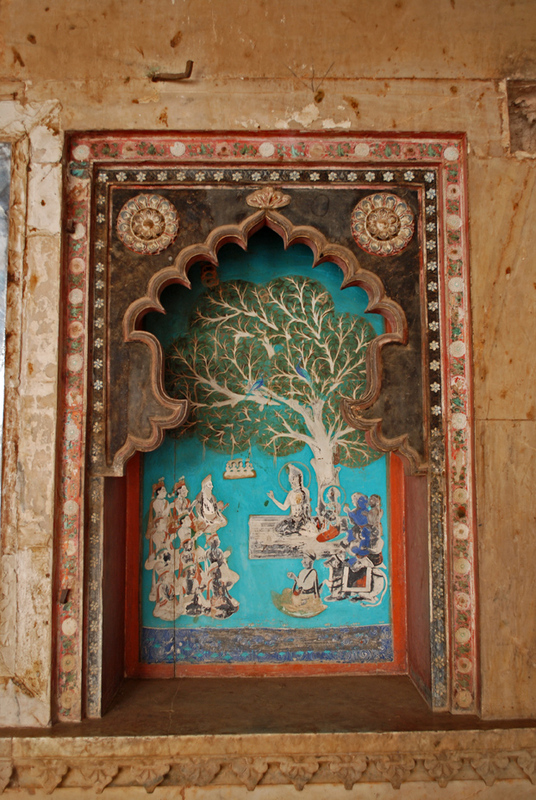 These compositions, massed with a variety of trees and floral creepers, ponds with lotus flowers in the foreground, fish and birds form a distinguishing feature of the Bundi style. Paintings like you wouldn’t believe. This is history on the walls. Never know how the hours went by! 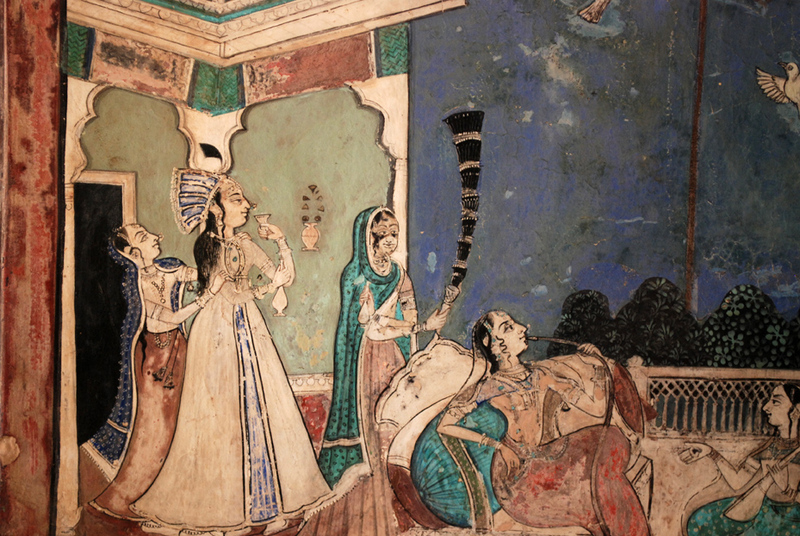 It is said that the existing tradition of creating miniatures was given a boost in 1605 by the sudden arrival of three master painters from Chunar, near Varanasi. 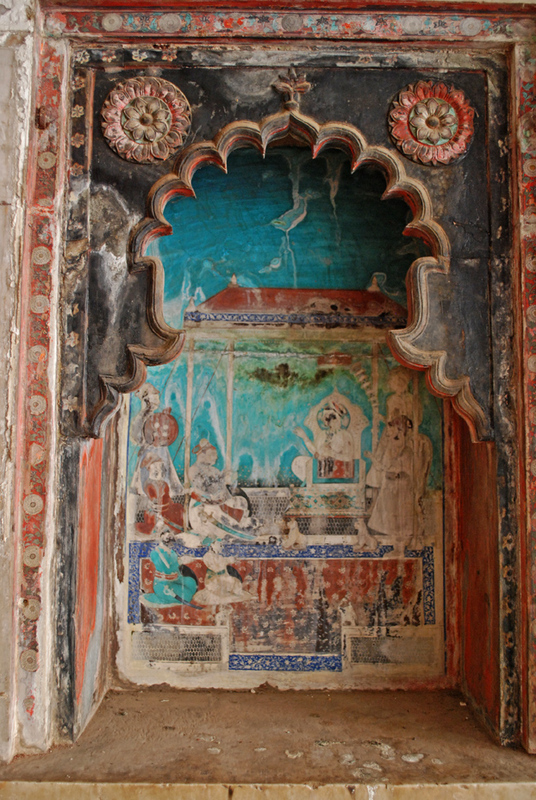 These painters were a gift from emperor Akbar, in return for Bundi’s obedience. 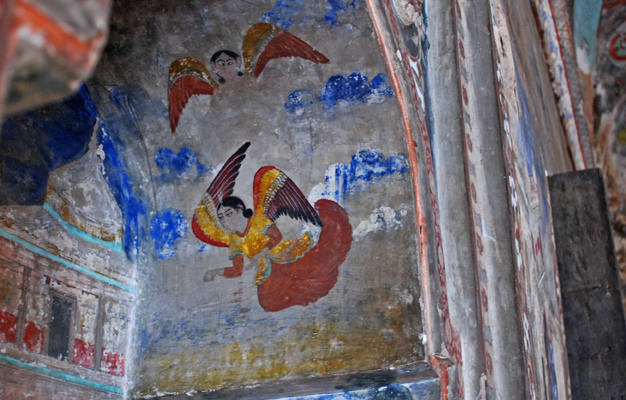 These painters who had previously worked only on palm leaf manuscripts changed their idiom by painting frescoes like those at Badal Mahal and Chitrashala. This zeal soon spread through the city, across classes and through time. Even today, a graffiti on the roads of Bundi usually borrows from city’s historic miniature style. Enchanting photos and impressive description. Regrets not to have reached Bundi, so far. But my did it alone two years ago.